Leave the water for the fish. With this land paddleboard, you can ride on dry land—no waves needed. 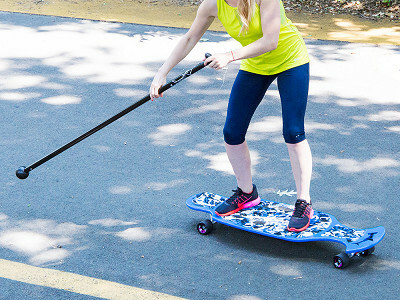 Hammerhead is the perfect combination of a long board and a paddleboard. Riding on one is like standing on an oversized skateboard, but the long, sweeping movement is more like boarding on the water. It really works your core, but it’s also really fun—whether you’re a teen or a grown up. The boards are made in Virginia Beach from sturdy birch wood that’s sourced in Pennsylvania. The distinctive hammerhead shape prevents paddle wheel bite, which is when the paddle or board’s deck hits the wheels (often resulting in a wipe out). With its spherical rubber tip, the adjustable paddle provides traction from any angle, helping you brake and steer through turns. 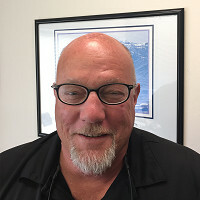 Scott Harris was a surfer before he took up paddle boarding. He came up with Hammerheads’ smooth-ride-promoting design. Along with Co-Founder Terry Siviter, they’re bringing one of their favorite board sports out of the water for anytime, anywhere cruising. Hello everyone! I'm proud to introduce Hammerhead to The Grommet. I'd be happy to answer any questions you have! Right down to the shape of the paddle end, you guys thought of everything. What was the toughest part about bringing a paddleboard to land? @mike We were ambitious with our performance goals for the product. We wanted to recreate, as close as possible, a paddleboard or paddle surf experience on land. I suppose the hardest (and most fun) part was field testing the components until we found those that best suited our design. From trucks, wheels, risers and pads, we carefully selected each component to create a quality product that shreds. These are handcrafted in the U.S., how important was that in development? @Mike - Very important. Our products are produced right here in Virginia Beach, and to the extent it's possible, we try to get our components from the US. That said, some of our components come from overseas simply because there isn't an American source option available. What is the weight capacity on the Hammerhead? @Bradley - Good question. Our decks are multi-ply baltic birch, very sturdy. Good for riders up to 325 lbs. Honestly, we haven't had one break yet. @Gordie - Absolutely. Great workout for your arms, back, shoulders and core. If you spend time on a Hammerhead, you'll feel and see results in no time at all. Awesome combination of fun and cardio. And if you paddle board or paddle surf, you'll feel the difference in the water too. Leave the water for the fish. With this land paddleboard, you can ride on dry land—no waves needed. 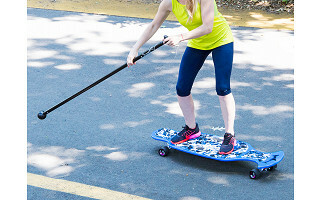 Hammerhead is the perfect combination of a long board and a paddleboard. Riding on one is like standing on an oversized skateboard, but the long, sweeping movement is more like boarding on the water. It really works your core, but it’s also really fun—whether you’re a teen or a grown up. The boards are made in Virginia Beach from sturdy birch wood that’s sourced in Pennsylvania. The distinctive hammerhead shape prevents paddle wheel bite, which is when the paddle or board’s deck hits the wheels (often resulting in a wipe out). With its spherical rubber tip, the adjustable paddle provides traction from any angle, helping you brake and steer through turns.